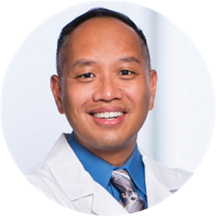 As a family medicine physician, Dr. Don Sarmiento specializes in the prevention, diagnosis and treatment of acute and chronic illnesses. His areas of expertise include men’s health, diabetes management, high blood pressure and high cholesterol. Dr. Sarmiento is board-certified as a family physician by the American Board of Family Medicine. He was very informative and was willing to listen to my issues and help with my concerns. Wonderful doctor. He is great. Really makes you feel like your in the right place..
Dr. Simiento listened attentively and took the time to answer ALL our questions. He was very caring. I was not able to see our primary care physician due to her busy schedule. Fortunately, Dr Sarmiento was able to see me and provide treatment for my ailment. I would not hesitate to see Dr Sarmiento in the future. Dr. Sarmiento agreed to see me on short notice on a Friday afternoon when I thought I might be coming down with the flu. He reviewed my health records before seeing me, and that made me feel that he was reallyinterested in my well being. He explained everything that might be happening to me and answered all questions with a thorough explanation. He made me feel like I was a VIP; I'm sure that he is that way with all his patients. He gave me a prescription as a contingency, but the good news is that I didn't need it. I hope I am able to see him the next time I need to schedule a visit. Dr. Don Sarmiento, DO has no appointments on Zocdoc right now.